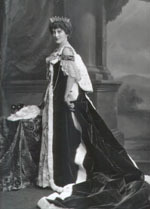 Mary (Caroline), Countess of Erroll (1849-1934), née L'Estrange. Sitter: Mary (Caroline), Countess of Erroll (1849-1934), n�e L'Estrange. 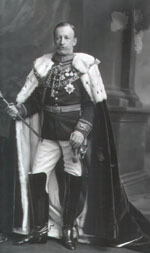 Biog: m. (1875) 20th Earl of Erroll. Occasion: The Coronation of King Edward VII, 9 August 1902. Location: The Lafayette Studio, 179, New Bond Street, London. Jewellery & Decorations: King Edward VII Coronation medal, 1902. Photographer: Lafayette Ltd., 179 New Bond Street, London. Provenance: Pinewood Studios; acquired 1989. Biog: Burke's Peerage; The Complete Peerage; The Times, 16 October 1934, p.16e. 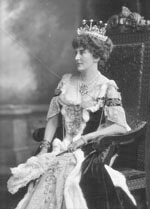 Reproduced: (Version) The Throne and Country, 14 June 1911, p. 39.